We congratulate all pilots on the approaching New Year 2018 and present a big winter update in Star Conflict — Journey! The transformative update will contain many important changes that gradually roll out including a redesign of the leveling system - players will earn new ranks, receive new spaceships and active modules throughout the story campaign as they explore the farthest corners of the known universe and its inhabitants. In addition, players will now be able to further expand their space fleet with new ranks (16th and 17th). These new ranks are the pinnacle of technological progress. Existing ships within their fleet will receive new active and protective modules. “Journey” will take place gradually to ensure proper balancing, but during the implementation of the full update, from December 19th through January 18th, all players’ flotillas will be replenished with a free new ship Object NY18. When entering the game, pilots will receive a special container daily with the ship's parts in it and must assemble it. Resembling a flying saucer, Object NY18 can intercept the control of enemy missiles and direct them to desired targets. It also boasts the ability to create a temporary spherical shield behind which the Allies can hide from enemy fire. Object NY18 will suit both beginners and experienced pilots. Depending on the number of selected modules, its rank can be changed from 5th to 15th. Existing ships within the fleet will be improved over time, but pilots can already try out almost two dozen modules, guns, and modifiers for Command fighters. Those who cannot wait to get their hands on the newest ships of the top ranks will be able to acquire them faster by completing special tasks in January. From December 19th - January 9th, players can earn xenochips and galactic standards taking part in tournaments, completing tasks, and simply winning battles. Rewards can be spent in the game store on special bundles, premium ships, and premium account. Also for the holiday season, there is a 50% discount on all goods in the store. Read more about the latest changes on the game's website. 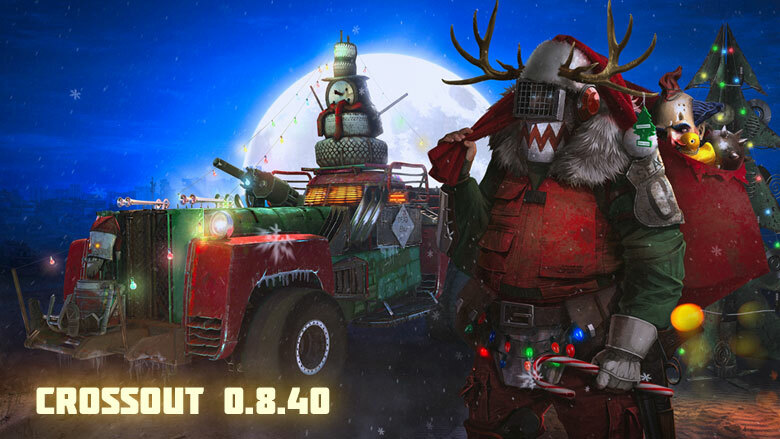 Crossout players can celebrate Christmas early with the release of 0.8.4 “Snowstorm” update. Beginning December 15th running through January 5th players can join the new holiday themed PvE mission “Christmas Heist”, earn “Crackers”, and exchange them for holiday car decorations, which multiply the amount of experience earned in each battle. In the ruthless post-apocalyptic world everything can be stolen, even Christmas. In “Christmas Heist” players must force their way into the bandits’ den, save the Christmas tree from being burned, find the gifts, and battle the grinch-like Bandit leader before returning Christmas. The storehouse is well protected, and the gifts are hidden in unexpected locations. Players can earn “Crackers” many ways during the holiday festivities. From victories in “Christmas Heist” to participating in “New Year Fever” PvP Mode to completing special daily tasks.“Crackers” can also be sold to other players through the market, or used to create various decorations for vehicles. The tier-made snowman, Rudolph's Horns, and a volley of fireworks are a few of the examples of holiday themed vehicle decorations that increase the amount of experience earned during battle. The “Snowstorm” update also brings stickers to Crossout. The first bunch of 15 stickers allows players to add some sweet holiday designs to their metal monsters. Santa’s sledges on hovers or a big red track armed with big guns – get ready to meet post-apocalyptic Christmas creatures in Crossout this winter! Survivors honour traditions of the past. In the second half of October Halloween comes to Crossout! During the celebrations, players will be able to wage battle on the all-new night map Sector EX, compete in the new ‘Witch Hunt’ PvP mode, and earn ‘Hazardous Sweets’ that can be traded for exclusive seasonal vehicle decor. In ‘Witch Hunt’, players have to attain festive Halloween Pumpalloons and keep them in their possession for as long as possible. All participants are equipped with an identical, unarmed vehicle and can steal the Pumpalloons by ramming the current possessor. Even without conventional weaponry, ‘Witch Hunt’ is anything but peaceful. All vehicles come equipped with six powerful Jet Boosters that provide an explosive burst of speed to ram your opponent when attempting to loosen an opponent's grip on the precious Pumpalloons. There is no reason to hold back - in this mode, respawns with new vehicles are unlimited. Halloween also brings with it the first night map added to Crossout - Sector EX - where survivors fight for control over an abandoned industrial complex located at the center of the map. While the defenders will be able to take positions on multiple floors of the complex, attackers can find their way inside through a maze of corridors and driveways. With darkness limiting the view, combat on Sector EX gets up close and personal - even for heavy trucks with long-range armament. During the next three weeks, victories in all Crossout PvP modes and the completion of daily tasks will earn players an extra reward in the form of ‘Hazardous Sweets’. While not fit for human consumption, they are useful to craft ‘Fright Containers’ through which survivors can obtain exclusive decorative items for their vehicles, as well as paints, car horns and player avatars. Those survivors that place no importance on appearance can, of course, sell the ‘Hazardous Sweets’ for profit on the market. More information about the new mode and the other Halloween specials are available on the official Crossout website! Founded by a group of talented scientists able to escape the devastating effects of the Crossout epidemic, the Dawn’s Children feature the most advanced technology in CROSSOUT to date. The most prominent example of their technological prowess is their widespread use of hover engines, allowing their combat vehicles to float above any surface - if you can keep control. Engines disabled by enemy fire or even the powerful recoil of one’s own cannons can all affect stability if not taken care of, so proper R&D in test drive is advisable before going into battle. Those that want to remain firm on the ground can switch to the new “Lunar IV” all-metal wheels, once designed to explore the harsh terrain of the Red Planet and other celestial bodies - luckily, in this case, the wastelands are not that different. In CROSSOUT’s newest PvE raid Chase, players have to intercept valuable cargo before it reaches its final destination. Carried by two heavily armed transports, the cargo can only be obtained if the team works together and chooses the perfect moment to strike - ideally when the transport’s powerful cannons are recharging. At the same time, players have to defend themselves from hordes of rival raiders, which may not be well armed, but are still more than capable to derail a carefully timed attack plan. Two new and challenging locations await the players of CROSSOUT 0.8.0. Cursed Mines is a labyrinth of mines and dugouts, an ideal place for ambushes and surprise attacks. Survivors are advised to travel in groups and always monitor their radar! On Broken Arrow, the site of a former spaceport, the main battle unfolds around the neutral base in the center of the map, surrounded by mountains and accessed by a variety of tunnels. Snipers are well advised to take position on one of the many hills and keep an eye on the tunnel exits. More information about CROSSOUT Update 0.8.0 is available here! The newest state-of-the-art engineering frigate ‘Waz'Got’ is the quintessence of scientific thought and the result of the collective work of all the employees and scientists of the Ellydium Theta station. The frigate's incredible capabilities will provide its allies with reliable support and will give a chance of victory in battle even over superior enemy forces. Trading system has received a significant upgrade. Now all pilots have a bulletin board for purchase and sale of in-game items. Hangar interface has been substantially redesigned. The updated version is simpler and more intuitive, and also has a modern and aesthetic approach to the design and style of the game. Also we continue to make balance changes in key parameters of game modes, weapons and modules. All changes have been made based on analysis of battles and statistics. We are proud to announce that Crossout has now moved into the open beta stage! From today, the game is available for free on personal computers and also on PlayStation®4 and Xbox One consoles. The beginning of OBT will bring even more content to the game. It will add a fifth faction ‘Steppenwolfs’ to the game — former soldiers, who prefer to solve any issues with the help of well-armoured vehicles and long-range cannons. Also a new location ‘Disaster area’ will become available — a mysterious place, covered with sand and stones, where survivors can find the remains of an aircraft carrying particularly important artifacts. Read more about all the new features in the changelog. In celebration of the first manned spaceflight in human history 56 years ago, Star Conflict team has announced the release of the major Evolution Factor update. Part of the new content is the second Ellydium spaceship as well as the PvE game mode ‘“Ariadne’s Thread”, in which players combine forces against a rogue Artificial Intelligence. The new innovative ship, which Ellydium shipyards presented to all pilots of the fringe sectors, is the scout interceptor Tai'Kin. The ship includes all the latest scientific achievements of Ellydium laboratories, which have reached new heights in the development of Alien technology. Tai’Kin is actually multiple ships at once due to its flexible evolution and customization system that allows for a large number of combinations in special modules and weapons, this fast and maneuverable interceptor will be able to outsmart its competition in many ways. Star Conflict’s brand-new PvE mode “Ariadne’s Thread” will see players explore the vast and experimental shipyards of the Blackwood Corporation, which is controlled by Ariadne, a sophisticated management AI. After repeatedly freeing itself from human control, it now has gone completely rogue by supplying the dangerous Cyber forces in their recent large-scale attack. With each new start of the mission the composition of enemy units is updated. Elite enemy ships with unique modules can also join the battle and turn the tide on the battlefield. Each new pass also gives players additional tasks that reward players with additional resources for successful completion! We have come a long way, and a small circle of like-minded people has grown into the largest game developer in the Urals region of Russia with more than 90 employees. We are never afraid to experiment, and over 15 years our portfolio has grown with projects of all possible genres and platforms, from big MMOs to console and VR games. Targem Games team is proud to have people who love their job, so our main goal is always to make games that are exciting for the players.And after all this time, looking back, we would like to note the projects that still have a special place in our hearts. Our first stop in this list is of course Hard Truck Apocalypse. The project launched in 2005 in collaboration with our first publisher ‘Buka’. The game has become a legend in the industry. Even after a decade the project is still remembered and loved by players and members of the development team. For many of them it was the first big project of their careers. Armageddon Riders. This game is also very special since it was our first project released by Targem Games independently on PlayStation 3.On other platforms, the game was published by Game Factory Interactive. In 2010 we started the fruitful collaboration with Gaijin Entertainment. Together with them we entered the then-new market of online games. One of the most famous and beloved Targem Games projects called the Star Conflict saw the light of day.The game was well received by fans of space and sci-fi, who dream of sitting at the helm of a spacecraft. 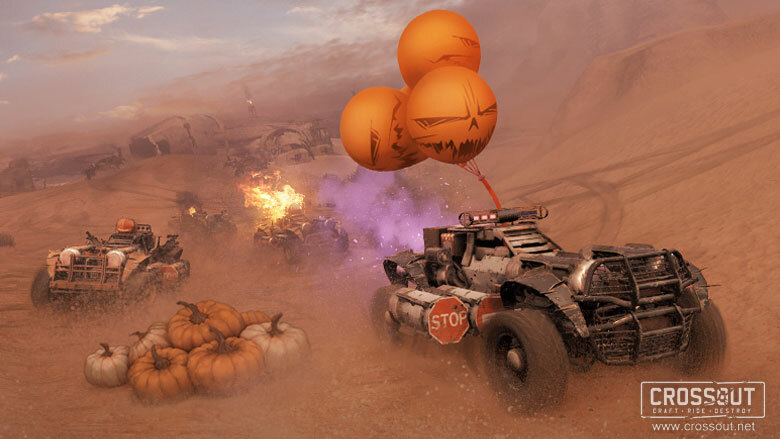 In 2015, post-apocalyptic trends and combined experience of Hard Truck Apocalypse and Star Conflict development teams united in the company's latest project Crossout. The project is now at CBT stage and is being actively developed to become the new legend of Targem Games. Our project BlazeRush also deserves a special mentions, since this is where we acted not only as developers but also as publishers.The game was released on multiple platforms: Steam, Android, PlayStation 3, PlayStation 4.In 2016 it was among the thirty first-party games for the ‘Oculus’ platform.And now it's getting ready to launch on Gear VR. We are proud of the work we've done and we thank the players from around the world for supporting our projects. We hope that the next 15 years will be even more productive and exciting!